Two teenage girls living in the London suburbs of 1963 possessed beautifully harmonious voices: Lois Wilkinson had just turned 19, shy girl Andrea Simpson was two years younger. They met while working in the office of an auto manufacturer, their musical like-mindedness leading them to one another's homes to practice whenever possible, hopes high, talents naturally at a level beyond their ages. Said Lois of Andrea: "She was the best possible choice as a singing partner." All four mums and dads approved, boyfriends not so much for fear of losing the apples of their eyes to the seduction of fame and fortune. Older country and western songs, faves of their elders, had caught the girls' fancy. 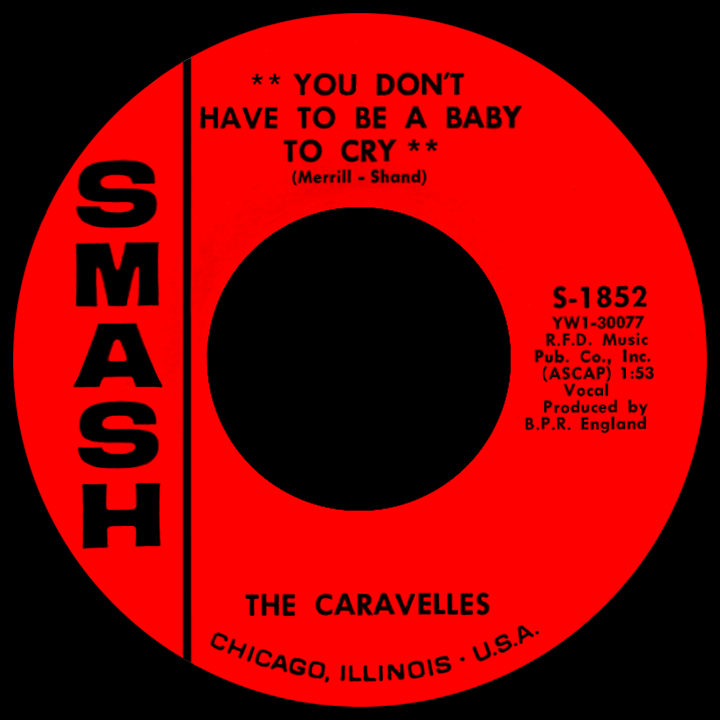 "You Don't Have to Be a Baby to Cry," written by prolific songwriter Bob Merrill with Terry Shand, had been a minor U.S. country hit for Ernest Tubb in the fall of 1950, becoming more instilled five years later when chosen as the B side of Tennessee Ernie Ford's unbelievably popular "Sixteen Tons," a single practically everyone bought...and some even played both sides. Lois and Andrea sent a simple one-take demo tape of the song to music biz types; seasoned London record man Bunny Lewis came 'round and suggested The Caravelles as a name, after the jet airliner produced in France by Sud Aviation (also in use for a time by United Airlines)...never mind the male Caravelles groups that littered the U.S. landscape, one a pop act from Detroit, the other a doo wop group from Pittsburgh, both established within the previous two years (one other, a rude, rockin' garage band came along a few years later, subversive enough not to care about the by-then well-known Brit duo). A more polished studio recording arranged by bandleader-composer Harry Robinson (not above dabbling in kitsch, he had been at the helm of some wild Lord Rockingham's XI hits in 1958), Lois and Andrea's finished take possessed a fanciful innocence no previous version could have conceived. Earlier male recordings somehow landed a little off-center; the Caravelles, by sheer virtue of the lyrics ('When you leave me, my golden rainbow disappears...'), gave the song an emotional power, however softly rendered, that it was meant to have all along. Their initial approach had been to emulate the style of adolescent late-'50s hitmakers Patience and Prudence, but what a difference a few years of maturity can make. Retro by design, they sounded like they came right out of a dream. They had an image unlike other girl groups, Andrea a bit gangly, Lois always strumming away on a guitar nearly as big as she. Both were implausibly cute and that meant marketable. Lewis intended "You Don't Have to Be a Baby to Cry" for release on his Ritz label, but the powerful Decca Ltd. provided more of a sure shot at success, so the single hit the streets in July 1963 on the Decca label with a Ritz Records logo to the right. Developing quickly, the song was in the top ten by the end of August; suddenly finding themselves inside the vortex, they toured Europe with the likes of The Rolling Stones, Del Shannon, Gerry and the Pacemakers, The Beatles and another new girl singer, Cilla Black. Then Smash Records picked up the master for American release and the whirlwind blew the two across to western shores. Echoing the song's rise in the U.K., it hit the U.S. top ten in December. Two months later they were on the bill of the Beatles' very first American concert in Washington, D.C. (with The Chiffons and Tommy Roe for moral support), sharing a dressing room before the show with Ringo and Paul. "I Really Don't Want to Know" (another transformed country-to-pop song) had stiffed at home, so Smash skipped it, opting to promote the third single, "Have You Ever Been Lonely (Have You Ever Been Blue)," a 1932 tune with lineage to Ernest Tubb, who had a C&W hit with it in early '49. Sounding nearly identical to its predecessor, the song barely lasted the month of February before radio and record buyers abandoned it. Wistful flip side "Don't Blow Your Cool," in retrospect, might have given them a better shot at a big follow-up hit. "You Are Here" was a lovely pop tune (as were most of their songs), but it stalled on release that spring. Nothing worked, in fact: "I Don't Care if the Sun Don't Shine" (a Mack David song with an Elvis pedigree), Gene Pitney gem "True Love Never Runs Smooth" and others were widely ignored. Smash had given up after four singles and one album. U.K. 45s appeared on Fontana to no avail. Lois and Andrea called it quits in 1966...not from making music, just from each other. Don't let it distress you...they remained good friends! Andrea kept the group going with another girl, near-Lois-lookalike Lynne Hamilton. "Hey Mama You've Been on My Mind" went in a folk-rock direction. '67 and '68 recordings "I Want to Love You Again" and "The Other Side of Love" had more of a sunshine-pop sound. Wilkinson ventured forth on a solo career with the name Lois Lane, paying no mind to the famous fictional Miss Lane, she of the nightly yearnings for some guy with an "S" on his chest named Clark Kent. This modernized Lois Lane had a flair for making established songs her own, a quality not noticeable in the dual voice setting; her 1968 cover of Simon and Garfunkel's "Punky's Dilemma" and a strange little tune called "Brontosaurus Named Bert" (which Lois called "delightful") have undeniable appeal. But as with the post-'63 Caravelles, the records weren't strong sellers. A shame, since the music is quite good...all of it. Unfortunate for the dreamy duo that it had to come to an end, but by decade's end it did just that. Or did it? Lois Wilkinson has continued singing, mostly doing studio session work in addition to TV commercial voiceovers and some acting assignments. Andrea Simpson has been sighted many times through the years with various blonde Loislike partners, keeping "You Don't Have to Be a Baby to Cry" and her connection to the '60s girl group scene an ongoing reality.